On an innocuous Wednesday night in 1982, I found myself alone in that dismally dank colored room with George Carlin. At the time, the Ice House was in danger of going belly-up and we’d begged the comedy community to help. They did so, categorically, in droves. Many, many comics turned out to help save the club including Gallagher, Robin Williams and on this night, George Carlin. The emcee, I’d just introduced the middle act so I had some 25 minutes to kill. I killed it in conversation with George. All the while we talked, he chain-smoked joint after joint. I’m guessing he consumed five. I say “guessing” because the contact high was so intense I’m still a bit buzzed to this day … some thirty years later. When the middle act finished, I introduced George to the audience, scampered to the back of the room and watched him work. Now, it had been my experience with comics trying out new material that maybe they’d engage one or two new jokes. On occasion I’ve seen guys do a couple of minutes of new stuff. I don’t know that I’ve ever seen any comic risk trying more than ten minutes of brand new material on a given night. 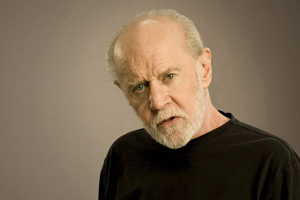 Carlin was into his act for fifteen minutes or so when he started in on his domestic playmates. Five minutes turned into ten turned into forty minutes of never before attempted material on cats and dogs. No pauses to retrieve a thought. No breaking character because the reaction wasn’t what he expected. Just brilliance at the highest (no pun intended) level. It had to be depressingly devastating for any comic cashing a paycheck that night knowing and witnessing George’s mind unplugged. I’ve never seen anything like it before or since. An American treasure breeding as God is my witness. The experience was a crossroads for me. Believing the key to it all was in the plant, I scored a joint from a buddy and decided to smoke it the next time I performed. Stoned, I told my first joke, then my second. Without knowing I’d done it, my third joke was a repeat of my first. I completely forgot my fourth. There was no fifth joke. Although my memory was a bit foggy, what I do remember about that night is I didn’t get paid. And my partners billed me for the bottle of water I drank even though I only took four sips.